From the makers of Gummy Pop, Space Cats Pop, Toys Pop and Dream Pop, here comes chilling bubble shooter - Frozen Pop. It’s time for an adventure in icy pop ! 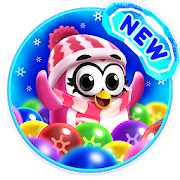 Bring on your warm clothes and get ready to shiver in a land filled with snow and colorful bubbles – "Frozen Pop" is the next ultimate bubble shooting saga!